American Dream Means Chase Your Dreams! I am speechless at what God has done in our lives. With all of the bumps in the road and all of the zigs and zags that life brings about, God always consecrates our struggles for our good and what I believe are His purposes. This is our story that was just featured by the LIFE organization, and telling it is a great honor for us. I hope it will inspire you to greatness in anything you pursue. Janelle and I are thankful that God has seen fit to put this somewhat introverted couple on stages all over the country to share our heart, tell our story, and cast a vision for what this world can be and what life can look like when one chooses to stop following the crowd. A million dreams are keeping me awake. 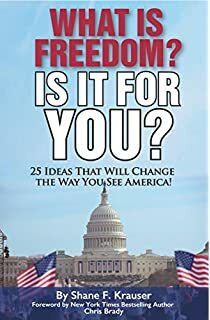 skrauser Shane Krauser is a political commentator, author, public speaker, radio talk show host, and admirer of the Constitution and freedom. He is an advocate of creating a leadership and entrepreneurial revolution in America and throughout the world.